The websites featured below have been identified by the i-THRIVE Programme as being digital front-end examples of best practice. This could be due to their creation in collaboration with children and young people, their move away from providing symptom and diagnosis based information to providing needs based information on emotions and experiences, their focus on demystifying and destigmatising CAMHS from the perspective of children and young people. 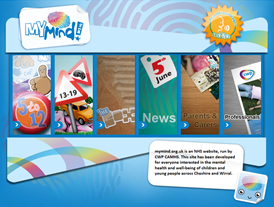 MyMind was developed in collaboration with children and young people to ensure that the website reflected the Child and Adolescent Mental Health Service (CAMHS) was about ‘working with’ and not ‘doing things to’ young people. Information on the website is categorised based on the age of the child or young person (5-12 years and 13-19 years) and there are dedicated provisions for parents and carers and for professionals that are distinctly separate from content for children and young people. Users of the website are filtered based on needs and simple bite-size information is provided. 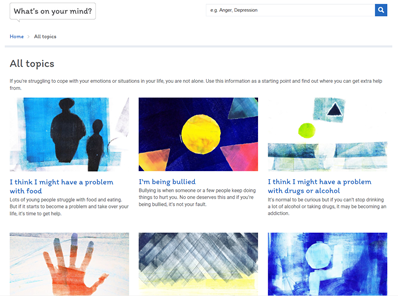 Unlike many traditional CAMHS websites, MyMind focusses on emotions, experiences and differences rather than condition or treatment. Content acknowledges that service users will have fears and that their concerns are only natural and emphasises that we share similar experiences and that these are often natural and understandable. Simple self-help strategies are provided alongside easy-to-access targeted contact information. The website is going to be refreshed in early 2018. We have identified this website as an example of best practice because like the THRIVE framework (Wolpert et al., 2016) it focusses on the needs of the child or young person and the voice of the young person is heard throughout the content covered. 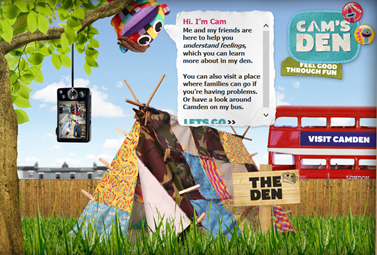 Cam’s Den was developed to promote the idea that help with emotional difficulties can be an ordinary part of school and community life. The website was created in consultation with a large number of children, parents and a range of professionals such as educational psychologists and teachers. The website sought to provide a fun and interactive learning tool to accompany the social and emotional aspects of learning (SEAL) national curriculum and to reduce stigma and blame about mental health in the wider community. The content aims to help children develop strategies for coping with common mental health issues and difficulties. In line with the THRIVE Getting Advice and Signposting needs based group, children, parents and teachers can use the website to be signposted to relevant NHS mental health services. A separate area is dedicated to helping parents to understand the emotional wellbeing of their children and provide advice and guidance about getting help if necessary. We would like to highlight the helpful video that was created to demystify what the CAMHS experience is like from the perspective of the child. How was the website created? This was one of the first digital forays into primary mental health and happened in 2008. We wanted to make a website that was both creative and engaging for primary age children. We held focus groups in each year in a local primary school to understand their needs, interests and behaviours. In parallel we were introduced to Absolutely Cuckoo who create and develop children’s TV shows, books, characters, puppets and animation. They had just created the incredibly popular Waybuloo CBBC TV show whose characters used mindfulness to work together. They wanted to work together to help create characters for the website that had heart, that were non-human but had human characteristics. We received funding from the Treasure Chest fund in Camden which shaped the content be more Camden-centric. Cam became the main character for the website and came to fruition due to creative workshops held in several local primary schools using puppets as a way of talking. These workshops were very successful within which we developed the idea of creating a den, a safe space for children with toys and Top Trump like games children could play with using the website’s characters. Parent and teacher information and resources were also included within the website. One of the great parts of the website is the Cam’s TV page where there are videos that we created in collaboration with children. One shows a child what it is like to come into the service, there is also a video of Cam in Camden singing a pop song about how to cope with feelings. To promote the website we made cards that people could take away in the waiting room and had posters on the walls. We are currently looking at implementing a quality improvement initiative to support CYP and their families to access this resource prior to their initial contact with CAMHS. My top tip to anyone considering creating a website like this is to think about resourcing the period after the product has been made to make sure it is sustainable and reaches as many people as possible. Launched in 2016, the website was developed by Nikki Titchener, Service Manager for East Riding CAMHS and Karen Warwick, Service Manager for Hull CAMHS. The aim of the website is to help people understand more about the services available to young people in the region who need mental health support. The information provided is suitable for young people themselves, parents and carers and professionals working with children and young people. 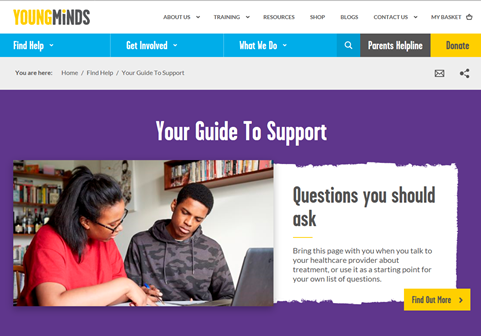 The area of the website dedicated to supporting young people guides them through what mental health is and the impact of ill health, along with providing information about what to be aware of and what to look out for. Young people can get advice about what to do if they want to speak to someone anonymously, and can also find detailed information about the CAMHS services available and what happens when you are referred. The topics covered aim to help explain the whole CAMHS process. This website provides a wealth of information on what is available locally and is a useful tool that provides Getting Advice and Signposting. 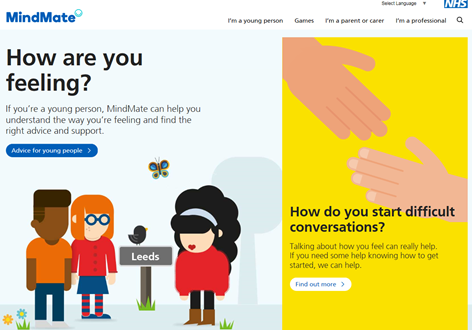 MindMate is a Leeds-based website for young people, their families and the professionals who support them. The aim was to make sure that the website was truly useful with the commissioners working with young people, professionals, parents and carers to do so. Children and young people in Leeds helped create and develop the website with an involvement panel approving the content, testing games, checking web links and creating new content. We want to highlight how successful co-creating the website with young people has been and how the games that have been developed especially for the website can help children and young people not just in Leeds to manage their emotional wellbeing and get support. Through collaboratively writing a five-year plan called ‘Gloucestershire’s Future in Mind’ with children, young people, families and others the CCG found that children and young people wanted to know what help and support was available to them locally and nationally. Bringing Stroud District Youth Council, Gloucestershire Young Carers, Gloucestershire County Council Ambassadors for Vulnerable Children and Young People and the pupils from the High School for Girls in Gloucestershire together to discuss what they wanted from the website helped the CCG to develop ‘On Your Mind’. The website was created through a collaboration with key stakeholders and provides advice and support on a wide range of difficulties that children and young people may experience. The contact details of the services available to children and young people in Gloucestershire are clearly accessible and additional resources are provided. 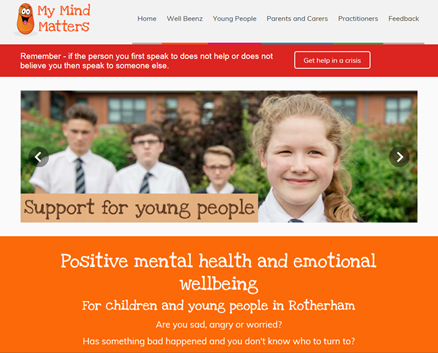 The website incorporates a wealth of targeted support, information and advice for young people, parents and carers and professionals regarding mental health and emotional wellbeing. The Rotherham Youth Cabinet helped develop the website in collaboration with the commissioning team, choosing the website name, informing content and design and supporting the launch event. Useful information about how to look after your emotional wellbeing, the organisations who can help and where to access support in Rotherham is provided in a clear and accessible format. 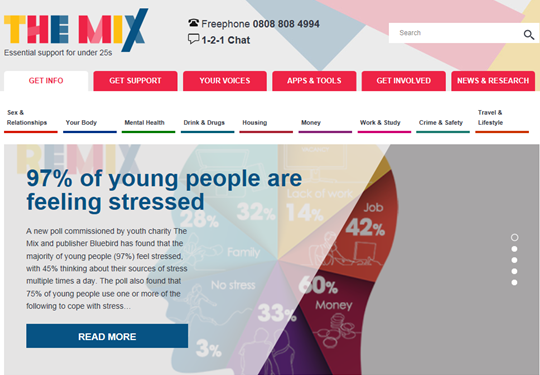 The Mix a charity that provides a free and confidential multi-channel service. Young people (13-25-year olds) can choose how they access support be it through articles and video content, online or phone, email, peer to peer and through counselling services. The aim of the website is to be the first point of call for under 25s and empower them with the knowledge, skills and confidence to make the right first steps in life. The website provides expert advice, strategies and resources to help with one’s mental health along with a host of other topics young people may find useful. Support is provided in the form of discussion boards and the Group Chat Service where young people can speak to trained staff. A local advice finder is a useful way to explore what services are available locally, regionally and nationally and there is a mobile phone app version called Stepfinder making access to services even easier. 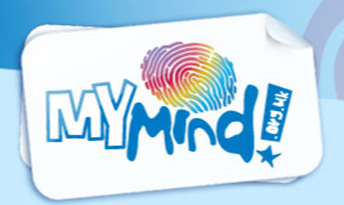 Young Minds is a leading charity committed to improving the mental health and wellbeing of children and young people. The website provides valuable information on a variety of feelings, symptoms, conditions and treatments as well as strategies for looking after oneself and a beginner’s guide to Child and Adolescent Mental Health Services. Information is targeted at children and young people but there is also a separate provision for parents including a helpline. stem4 is a teenage mental health charity aimed at improving teenage mental health by stemming commonly occurring mental health issues at an early stage. The focus is on early awareness and intervention, providing evidence based information and bringing people together to share experiences. Information on the website covers four specific areas of mental health: eating disorders, depression and anxiety, self-harm and addiction. Self-help is provided through their Calm Harm app, the website and downloadable booklets. 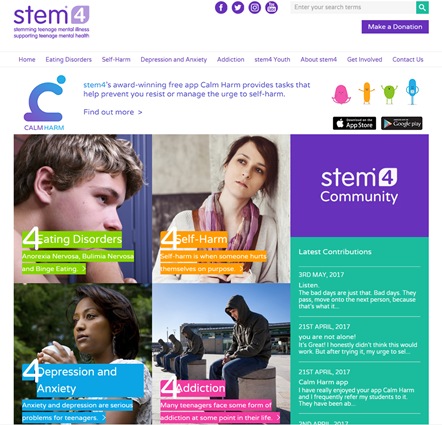 In addition, stem4 have compiled a library of educational and easy to digest videos with up-to-date professional information on how to identify early signs of mental ill health and first steps in management. We have identified several useful resources that can support children and young people who fall within the THRIVE Framework Getting Advice and Signposting needs based group. Sites can draw upon the featured websites when designing their own digital front ends or can signpost children, young people and their families to them. 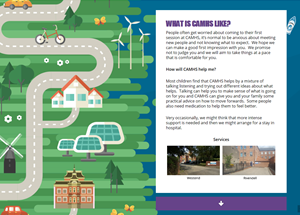 These websites provide accessible information on symptoms, treatments, self-management and coping strategies, the resouces available to children and young people both locally and nationally and can help to demistify and destigmatise the CAMHS experience. Please view featured website links on a PC as accessing the links via tablet or phone may result in distorted layouts.